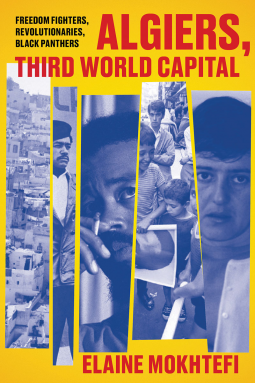 Algiers, Third World Capital by Elaine Mokhtefi is a memoir and history of an American involved in the newly independent Algeria. Mokhtefi was born in New York. After the Second World War, she joined the youth movement for world peace and justice, becoming director of a militant student organization. In 1951 she settled in France as a translator and interpreter for international organizations in the new postwar world. In 1960, she joined a small team in New York as part of the Algerian National Liberation Front, lobbying the United Nations in support of the government in exile and working for Algerian independence. When the struggle was won, she made Algeria her home, working as a journalist and translator. She married the Algerian writer and liberation war veteran Mokhtar Mokhtefi, who died in 2015. Mokhtefi’s short biography above speaks a great deal about the book. Her relationship with Algeria is somewhat unique. She was, after all, an American (Imperialist), non-Arab Speaking woman of Jewish descent. She was, however, at the right place at the right time and with the right attitude. Algeria’s quest for independence was long, bloody, and vicious. Mokhtefi had the sympathy for the Algerians living in France and witnessed the violence against them. Algeria became her cause as she worked in the D.C. office of the Algerian National Liberation Front. The New York Office took responsibility for revolutionary Franz Fanon visit to the US although he never made it to New York. He died at Bethesda during his visit, and before his, The Wretched of the Earth was published. She moved to Algeria after its independence and worked through some unusual times. Algeria became a popular destination for those fleeing US law enforcement. Mokhtefi met airline hijackers who made Algeria their goal, Black Panthers, and Timothy Leary. The hijacking was quite famous. William Holder and his female accomplice hijacked the plane with a fake briefcase bomb in Seattle. He successfully collected $500,000 and landed in Algiers although they did not secure the release of Angela Davis. The plane and most of the money was returned to the United States through diplomatic channels. Although Algeria wanted to free the oppressed and help other nations gain their independence, making an enemy of the US was not seen as a smart position. Algeria would need the US to buy its oil. Algeria was in a tight spot between the ideological and the practical. Mokhtefi gives the reader a first-hand account of the early and turbulent history of Algeria. Time has done much to curb her revolutionary vigor, and she presents a reasonably balanced view of her experiences. I still imagine it is difficult to separate oneself from history and offer a completely unbiased account. She does give the reader the inside view of a new government and a turbulent time. I can relate to all what you’ve mentioned. I hope I can get my hands on it so I can read and see all this by myself.